The War of the Roses seemed to be over. The mad King Henry and his queen, Margaret of Anjou were overthrown and Edward IV kept the crown steadily on his head for three years. An alliance with France and a betrothal to a French princess were in the works. And then came Elizabeth Woodville, the Capulet to Edward’s Montague. Upon entering Margaret of Anjou’s court, Elizabeth Woodville quickly became known as the belle of England. She was a fair-faced, heavy-lidded, flaxen-haired beauty. Letters between Richard Neville and Richard of York describe her as the loveliest and most sweet-mannered maid in court. The two men tried unsuccessfully to marry her to a poor knight, but Elizabeth, though penniless herself, used her fair face to rise. She married the wealthy, yet handsome John Grey. 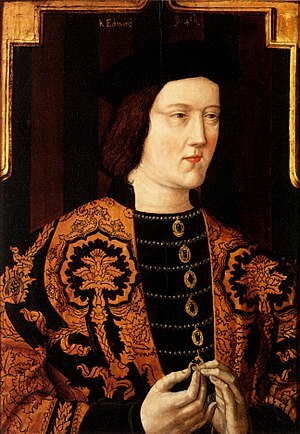 When King Henry went mad, leaving only an infant son for heir, the York cause grew stronger. Clashes between Richard of York and Henry’s wife, Margaret of Anjou, fueled flames between the two lines. Battles raged again and most in England chose either the white rose of York or the red rose of Lancaster. The Woodville’s remained loyal to the Lancasters. Elizabeth and her mother, Jacquetta, served Margaret of Anjou faithfully. Elizabeth’s father and brothers fought bravely against the Yorks. Elizabeth’s husband, John Grey, lost his life under the red rose, dying in the Second Battle of St. Albans. Elizabeth’s sons were denied their inheritance, leaving them destitute for two years. When Elizabeth heard the king was hunting near her mother’s castle in Grafton, Elizabeth, with a son in each arm, waited under a tree for Edward to ride by. She dropped to her knees and begged for his mercy. The young king fell for her immediately, but Elizabeth would not give herself lightly. Edward was a known womanizer and Elizabeth denied him. This only made Edward want her more. The two wed in secret in her family’s home on May 1, 1464. Edward seemed reluctant to acknowledge Elizabeth as his wife. She gave birth to their first child only five months after Edward publicly acknowledged her and it took over a year for her to be crowned. The irony of Edward’s choosing an impoverished Lancastrian bride was not lost and never forgotten by those who helped him to the throne. Edward must have been quite besotted with her, knowing the marriage would not only upset the truce with France, but also his English allies. Perhaps no one was more disappointed by this union than Richard Neville, who worked diligently to secure the alliance with France. All in all, Elizabeth and Edward’s marriage was a fruitful one, producing ten children. Elizabeth rose quite high, from a low-ranking noble to the Queen of England, though the death of her second husband forced her to fall quite far. This entry was posted in Young Adult Fiction and tagged Andrea Cefalo, Earl of Warwick, Edward, Edward IV, Elizabeth, Elizabeth of York, Elizabeth Woodville, England, English History, Henry Tudor, Medieval History, Richard, Richard III of England, Richard Neville, Royal History, Sanctuary at Westminster, The Cousin's War, The Fairytale Keeper, The Tower of London, Wars of the Roses, York on February 12, 2013 by Andrea Cefalo.